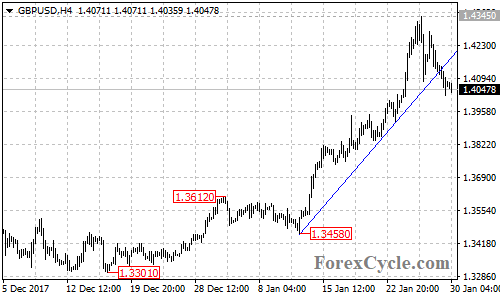 GBPUSD broke below the bullish support trend line on the 4-hour chart, suggesting that the uptrend from 1.3458 had completed at 1.4345 already. Further decline is still possible and next target would be at 1.4000, followed by 1.3800. Near term resistance is at 1.4130, only break above this level could trigger another rise to test 1.4345 resistance.